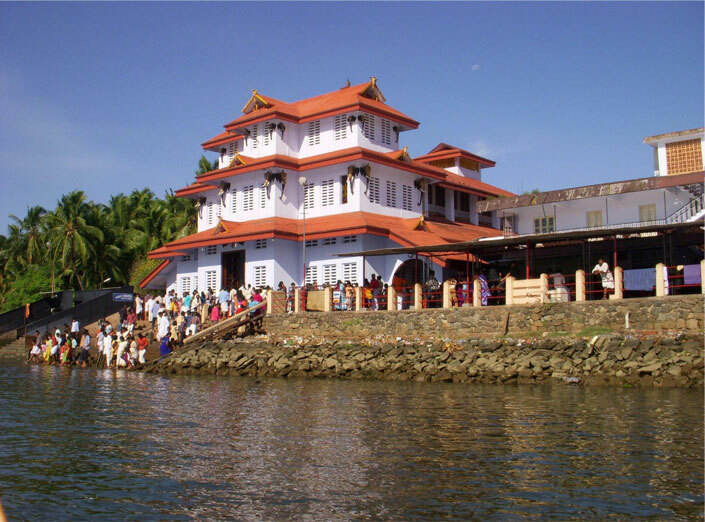 Parassinikadavu Sri Muthappan Temple is located in Kannur district. It lies on the bank of river Valapattanam. Here the deity is Muthappan who is a local God in Kannur. He is in the form of a hunter with a bow and an arrow. He has a dog as companion. People irrespective of caste and religion visit this temple. At the entrance of the temple two figures of dogs made of bronze are kept. They are considered as the guards of God. The dogs are given much importance in this temple and the Prasadam is first served to the Dog. As there are numerous dogs in this temple, the temple authorities decided to reduce the number of them by taking the dogs to far away. It is believed that while performing this Theyyam Muthappan enters the person’s body and the performer becomes a God until the ritual is over. It was surprising that from that day onwards, the person who performs the Theyyam was unable to do so. The people believed that Muthappan has refused to enter the performer’s body as the dogs were sent away. Knowing this the dogs was brought back and then the person could perform the Theyyam. The legend behind the origin of this temple is that Muthappan appeared as a child in front of Padikutti amma. This child created a nuisance to all and was sent out from that house. Muthappam who carries a bow and an arrow wandered everywhere and reached the Puralimala. On his way from Kunnathurpadi he climbed a tree and drank toddy. A Chandan who came that way was converted into a rock at the gaze of Muthappan. Muthappan then disappeared from here and nothing was heard about him afterwards. People believed that he reached Parassinikadavu. Theyyam is conducted here daily and is the only temple in which Theyyams are performed daily as a ritual. In this ritual, men who wear mask and wearing colored costumes perform the Theyyam. It is believed that the person while performing this theyyam, attains the power of God. Pilgrims come in large groups to see this. There are two Theyyams performed here namely the Thiruvappana and Vellaattom. Lunch is provided from this temple to all the devotees. All the devotees who arrive here will be provided tea, boiled gram and slices of coconut as prasadam. The annual festival in this temple is conducted in the month of December.